Many people wish they could travel more but feel constrained by their finances and work commitments. Travel is expensive, especially if you are having to take unpaid leave to go on a trip or you’ve just finished high school and you’re madly saving for a gap year working long hours in a cafe. 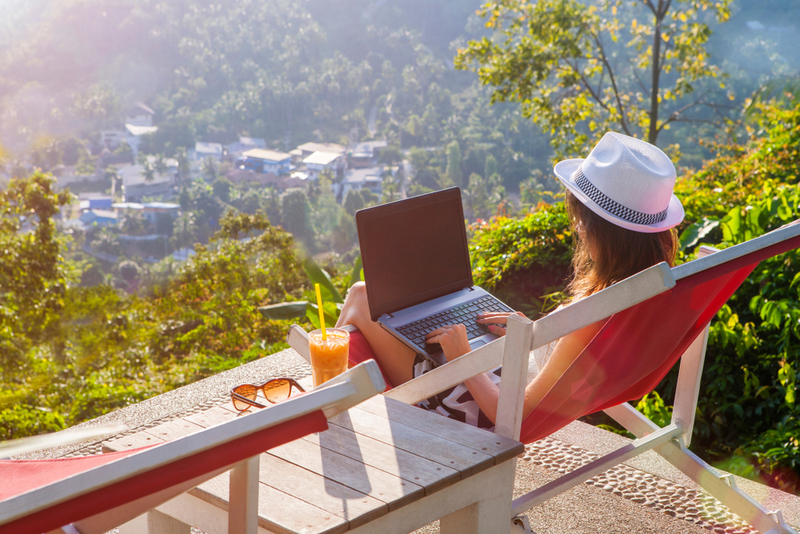 If you’ve been craving some adventure, and the freedom to travel the world more widely and frequently than your two weeks of paid leave allow you, consider a career that you can take with you anywhere. There are many jobs out there that will allow you to travel and work in perfect harmony. As discussed in my recent article about how to become a web developer, careers in web design are booming. All over the globe businesses and individuals are feeling the pressure to have a strong presence in the digital realm. This means you can conceivably get work wherever there are clients who speak your language, but it also means you can work for overseas clients back home in Australia. Web design is a job that you can take travelling, but you need to be able to prove you’re capable. It’s not a job where you can ‘fake it til you make it’. Upskilled offer a Certificate IV in Web Based Technologies (ICT40315), a Diploma in Website Development (ICT50615), and a Dual Diploma of Digital Media Technologies and Website Development. (ICT50915/ ICT50615). According to Job Outlook the future growth of this industry is very strong, and the average weekly salary is $1,150. An Au Pair is a young person between the ages of 18-30 who lives with a family overseas for a specified amount of time. The Au Pair helps out with childcare and housework in exchange for food and lodging, as well as some pocket money. This is an amazing opportunity for a young person keen to immerse themselves in another culture, learn a language and spend time living overseas. It is different from being a nanny, and many countries have a specific Au Pair visa which means you don’t need to apply for a work permit. An Au Pair works a set number of hours per week, and travel opportunities to neighbouring countries and provinces are plentiful. If you are qualified to work with children you’ll be eligible for some incredible homestays – check out our Diploma and Certificate III. In Australia the future growth of the child care industry is very strong and the average weekly salary is $800, so you’ll be able to get work once you’re back home. This is another type of job completed almost entirely online. Digital marketing, including social media management, is becoming a global industry. Every business, big and small, is trying to figure out how to manage and sustain an engaging presence online. Check out how to upskill in digital marketing here, to build an impressive CV of skills that can gain you employment all over the world. Marketing experts are highly sought after, and the demand is only expected to increase as the industry experiences strong growth here in Australia, where the average weekly salary is $1,346. It goes without saying that events are happening in all sorts of ways, all over the world. Experience in events equips you with a highly transferable set of skills. Have a look at our Diploma and Bachelor level courses in event management if you’re interested in pursuing this dynamic, creative career further. Both courses include a unit focusing on event management in a global environment. What’s attractive about event management is the future growth of the industry is set to be very strong, and you only need to be qualified at a diploma level to jump into an industry where the earning potential is $1,313 on a weekly full-time basis. This is a truly global industry, and if you work for an international hotel chain you may be able to arrange transfer opportunities between countries. All hotels and tourist outlets value English speaking staff, and if you have a second language that’s all the more advantageous. Experience or qualifications are highly sought after, so consider our Bachelor of Business (Tourism Management) (081295J) if you want a leg up on the competition. In Australia, Hotel Service Managers are expected to see strong industry growth over the next five years. They currently enjoy a weekly salary of $962. Speaking English as your mother tongue is a huge privilege globally. English has become the ‘universal language,’ the language that bridges gaps between people of different backgrounds and nationalities. There are all sorts of opportunities overseas, within schools, private colleges, government initiatives or as a private tutor. Some expect a qualification, some deem being a native speaker as enough of a qualification. Australians have established a great reputation in the global hospitality industry, especially in café and bar work. If you’re keen to settle down for a year or so somewhere overseas, it’s not too hard to get a working holiday visa if you’re under 30. These kind of jobs are a great way to meet people, in addition to being fast-paced and a lot of fun. Plus, it’s not a job that hangs over your head once you’ve clocked off. If you want to increase your earning potential within this industry consider a qualification in management. A Bachelor of Business (Hospitality Management) (081294K) will help you get work all over world. In café and restaurant management Australia unemployment is below average, future growth is strong and the average weekly pay is $900. If you have a skill or a passion, think about whether you can monetise it. Photography, videography, writing, and editing are all jobs that are often freelance. The intimidating part of freelancing is the instability of your income, but the huge advantage of it is that you’re your own boss. By building a network and a portfolio, you increase your capacity to take your freelance lifestyle overseas. All over the world Australian qualifications are regarded highly. If you’re keen to work and travel simultaneously, aspire higher than cleaning the loos in a backpackers hostel. Gaining some skills and experience in one of the industries listed above is a great way to increase your mobility. Speaking of mobility, working overseas can boost your career if and when you come back home. Experience working in a variety of workplaces, countries and cultures demonstrates flexibilityand adaptability. It indicates that you’re a curious, driven person who is able to work in all sorts of settings and situations. If you’re still feeling conflicted, read this article comparing travel vs. further study, or this article about how travelling can boost your career. Whether you’re just out of school, or you’re in the workforce and feeling intense wanderlust, remember that it’s more than possible to pursue a career that allows you to travel, you just have to choose to pursue it.